What Will it Take to be a NextGen InfoPro? 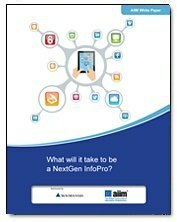 Free White Paper: What Will it Take to be a NextGen InfoPro? You're going to need a whole new set of skills. Do you know which ones? The information management landscape is changing at an exponential rate, putting new demands on how we are required to manage all of our information across the enterprise, and beyond. NextGen InfoPros must be aware of and anticipate these changes along with the impact they will have across the organization. This requires a specialized set of operational skills alongside acquired knowledge of the current and evolving technology sets.